A Cathay Pacific flight crew witnessed something they probably didn’t expect to see on their journey last week: a North Korean missile. The company told the BBC News Monday that a crew witnessed what was likely the reentry of the North Korean intercontinental ballistic missile (ICBM) into Earth’s atmosphere last week. ICBMs shoot into space, where their payload is detached, and then arc down reentering the Earth’s atmosphere to hit a target. 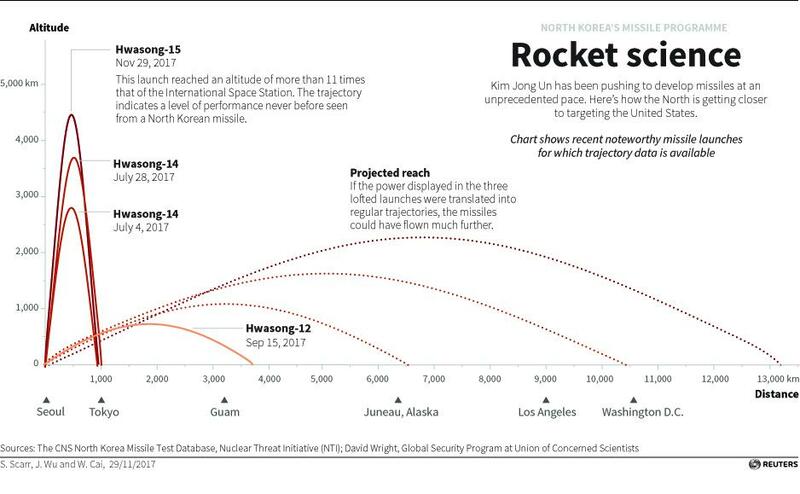 The North Korean ICBM launched Wednesday was shot at an extremely steep arc, almost straight up and then straight down. The missile flew ten times higher than the international space station and then back down to Earth. Missile remnants landed in the Sea of Japan. The missile marked North Korea’s third ICBM launch this year, and experts believe the missile is able to strike anywhere in the continental U.S. Despite coming close enough to see the missile’s reentry, Cathay Pacific told the BBC that there are no plans to change flight patterns at this time. Cathay Pacific General Manager Mark Hoey sent a statement to the staff stating “today the crew of CX893 reported, ‘Be advised, we witnessed the [North Korean] missile blow up and fall apart near our current location,’” according to the South China Morning Post. Several other flights also appeared to be in the area when the missile reentry. Two South Korean pilots reported sighting the missile reentry, according to South China Morning Post. North Korea does not typically announce their missile tests, which catch the world by surprise. The risk posed by a missile to airplanes is low, but in August, Air France increased their no-fly zone around North Korea after one of its flights flew close to one of its missiles. North Korea has access to international civil aviation data, but how or if it factors into its missile tests is unknown.